Few functions of government are as central to American democracy as the U.S. census. In particular, the headcount conducted every 10 years is used to allocate U.S. House seats (and Electoral College votes), to redraw congressional and state legislative districts, and to distribute federal funding for everything from health care to transportation. In our system of government, if you are not counted, you do not count. Why is the citizenship question so damaging to the integrity of the census? Every day, it seems, there is a new horrific story about immigrants being detained by Immigration and Customs Enforcement or by the Border Patrol. Just this month, a combat veteran who completed two tours in Afghanistan was deported to Mexico, a mother was picked up by the Border Patrol off a street in California in front of her screaming kids, and a farmworker couple were killed in a car crash while fleeing ICE, orphaning their six children. The fear in Latino communities around the country, which account for a majority of undocumented immigrants and are consistently targeted by ICE, is palpable. Including a question about citizenship on the census will have a chilling effect on Latino participation in the nationwide count. If you are a part of the Latino community, you are probably a citizen or a legal permanent resident. But you probably know someone who is undocumented—a neighbor, a friend, perhaps a relative or even a parent or grandparent. Now imagine a man from the government comes knocking on your door. He wants to know who lives with you. He wants to know: “Who here is a citizen?” No one could fault you if you chose not to open the door. The prevalence of mixed-status families practically guarantees that the 2020 Census will dramatically undercount the Latino population. 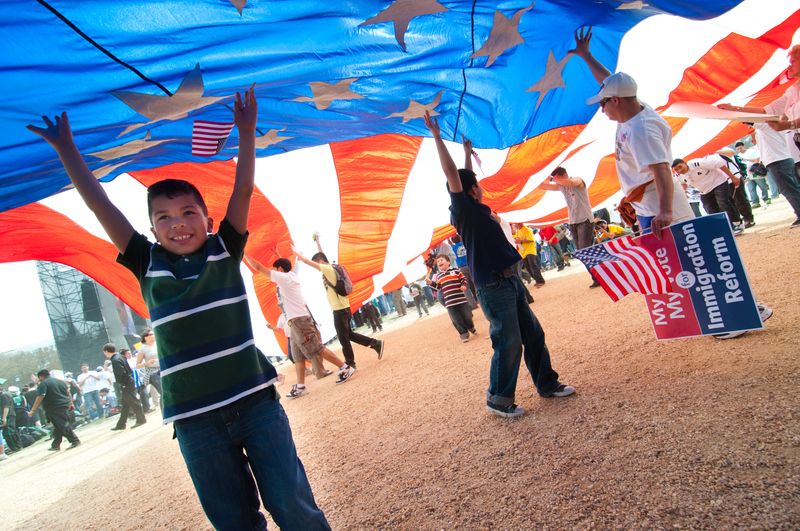 The prevalence of mixed-status families (73 percent of the children of undocumented immigrants are U.S. citizens) practically guarantees that the 2020 Census will dramatically undercount the Latino population of the United States. If we are not accurately counted, then we cannot be fairly represented. Diminished political clout will, among other things, lead our communities to lose access to health care, education and other important funding. In short, the chilling effect of the citizenship question on the 2020 Census will result in a lack of equal franchise for Latinos. This is why, contrary to what White House Press Secretary Sarah Huckabee Sanders has claimed, the citizenship question has been left off of the decennial census since 1950. (Since then, the Census Bureau has included the question only on supplemental surveys.) In their decision to restore the citizenship question to the census, the Commerce Department has cited the enforcement of the Voting Rights Act, which relies on data about the voting-eligible population, as a justification. That is a laughable assertion. The administration has never demonstrated any interest or committed any effort to defending the voting rights of U.S. citizens. Indeed, on many prominent voting and civil rights cases, the Trump administration has asked the Department of Justice to switch sides after the Obama administration had intervened to protect voting rights. And adding the citizenship question to the census goes against the intent of the Voting Rights Act by discouraging members of minority groups from seeking full political representation. Adding the citizenship status question to the 2020 census is perhaps the most insidious manifestation of the anti-Latino bigotry President Trump has exhibited since his first day on the campaign trail. California, where an undercount of the population could result in the loss of a congressional seat, is suing to prevent the question from making it on to the census, and at least 11 other states have indicated they will sue the Trump administration over the question (in part because it is being rushed through without the vetting that other changes to the census have received). And legislative efforts to protect the integrity of the census have been brought forward by Democratic members of Congress. Ultimately, however, the only way in which the rights of citizenship can be defended is by their persistent use. U.S. Latinos must awaken to this threat to our political rights and vote in 2018 and 2020. Because after the census, our votes may not be given their fair weight. Why is anyone who is legally here threatened by this question? The answer is they are not. What this is about is using illegals to bump up the numbers in certain areas to drive the location of congressional seats towards a particular political party. Guess which one. It is also about distribution of government funds whivh are based on bodies not citizens. The places most likely affected are California and large cities such as Chicago, New York. Philadelphia, Miami, Washington DC area, Atlanta and large cities in Texas. About 8-10 Democratic districts could disappear. People generally feel threatened if they feel they are going to lose someone close to them. If a mob boss threatened not you but your family to extort money from you, you'd agree you are still threatened, yes? So US citizens with undocumented friends or relatives certainly feel threatened if they think the Census could pass their info along to ICE. We don't want bad things to happen to people we care about. That doesn't mean we lose our constitutional rights to be counted and to be represented in congress fairly. Your response above is that a citizen will not answer the census because someone who is not a citizen may not respond?? Your response that a citizen who responds will somehow expose his non citizen friends to ICE is similarly a whole cloth mental fabrication. As a citizen your constitutional rights are not threatened in any fashion by your honest response to this question. As in all matters involving the law you always have the choice of remaining silent without impairing your other Constitutional rights. Simply put, your "fear for another" is not a legitimate excuse for anything. If it were, then the entire country would be in a constant state of paranoid paralysis. The conundrum you present is that an illegal resident is trapped between exposure of his criminal presence and being counted for representation purposes. Seems that being an illegal resident has a rather minor consequence ......imagine that, a consequence !! Someone who is a citizen should feel no threat at all. A non citizen who is here legally also has no threat either. What you are saying is that they may know someone who is here illegally and feel threatened because of that knowledge. No one is going to ask them if they know any illegal person so how are they threatened? The ones who are here illegally will avoid the census taker. But then they won't count towards a congressional seat. What you are asking is that illegals have a congressional representative which is a perversion of the representative process. I'm not sure I understand how reporting one's citizenship status makes any illegal aliens living with them more at risk than they would otherwise be without citizenship status being reported. Seems to me, the real fear here is that people who are here illegally want to drive the politics in the country by submitting census forms. But if you're not a citizen and are here illegally, that would be taking a risk that they do not want to take. Hey Mike! The Supreme Court actually ruled on this - everyone in a district is counted regardless of citizenship status, age, ability to vote (remember lots of citizens can't vote - namely children, but also people who never registered or ex-cons or whoever). For the purposes of representation everyone is counted. There's a fraught history in this country of choosing how to count people - the 3/5ths compromise in which slaves counted as 3/5ths a person is the most notorious example. So constitutionally speaking everyone needs to be counted. Assuming the questions are answered honestly, the information gathered will be valuable. It's time we knew how many people are here illegally. They will avoid the census taker. So we won't know who they are or how many there are. Some comments above solely intend to disorient the author and readers. To the aristocracy, the article’s merit is immaterial. The aristocracy intends to render dysfunctional any part of the constitution with potential to challenge the aristocracy. Anything of the people, for the people, by the people has no use whatsoever to the aristocracy. What exactly does this " Aristocracy meme" of yours mean? You are populating the comments on multiple articles with this undefined reference. Mr Kotlarz is an elitist/aristocrat defender. He hides behind comments against them but then supports the elites in the United States in everything he recommends. Somehow he believes being anti-Trump is a defender of the common person. I find it amusing for him to insinuate that people like myself are a defender of the aristocracy when my mother started working after 6th grade and my father never finished high school. I did manage to go to college as a commuter and get a graduate degree using money from military service to finance it. So Mr. Kotlarz, consider me to be anti elite and a defender of the common man. But how one defends the common person is not so straightforward as the Democrats want you to believe. It is not by giving one something though a government plan did help with my graduate degree. It is by making opportunities for them. I was the product of lower middle class America and a free market economy provided the opportunities not the government or the elite/aristocracy. Mr. Cosgrove, an attack on the voting rights is classic aristocracy. Right-To-Work states have 85% of the nation’s voters who are disenfranchised due to a felony. Voter ID efforts are nothing more than a poll tax on the poor. Does a minimum wage diabetic spend twenty dollars on a medical copay for a shot in the eye to save their sight or twenty dollars on a copy of a birth certificate for a voter ID? Gerrymandering disenfranchises many who vote. Ideally, the electorate has numerous competitive election races nationwide. Instead, the election can default to a few swing states, where some self-respecting billionaires would not even consider living in but contribute millions to election campaigns in those states.